Like all other states, there are plenty of haunted places in Ohio. Ohio's long history is filled with ghostly legends and stories, so it is no surprise that it's very easy to find real haunted houses in Ohio. 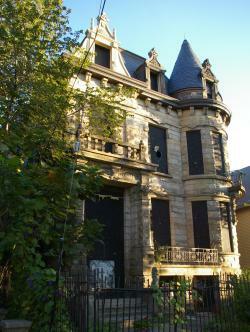 The Franklin Castle in Cleveland, Ohio has a reputation of being the most haunted house in Ohio. The historic castle was built in 1865 by a German immigrant named Hannes Tiedemann. Tiedemann was a wealthy banker, but tales regarding him identify the man as a temperamental and violent person. He lived in the mansion with his wife Luise and children. The history of this family is both catastrophic and steeped in rumors about gruesome activities and horrific circumstances. The earliest known facts regarding the family's tragedies are from 1881 when his daughter Emma, only 15 years old, died from starvation related to diabetes. Shortly after, Tiedemann mother died in the house as well. Over the next three years, the family suffered from the unspeakable tragedy of three more children dying. It is possible this marked a time when Tiedemann, and possibly his wife, started to slowly lose grip on reality. The following years are where the rumors of murder begin. Some claim Tiedemann murdered his niece by hanging. Other rumors claim that he murdered a servant girl when she rejected his advances. Still other stories claim that small children and babies, were murdered in the home. Surprisingly, this is supported by evidence that arose years later when one of the subsequent owners discovered dozens of old baby skeletons in one of the hidden rooms. The reported hauntings at this castle are some of the most disturbing and unsettling of all cases of haunted houses across the state. A Cleveland nurse reports that, while caring for a resident in the house in the 1930's, she heard the sound of a small child crying in the house. No children were reported to live there at the time. In 1968, the Romano family lived in the house. The children met a small girl upstairs crying, but the parents couldn't find her. Mrs. Romano heard organ music, footsteps in the hallways and voices on the third floor. When the Northeast Ohio Psychical Research Society investigated for the Romanos, one terrified team member fled the house. The next owner, Sam Muscatello, reported seeing a woman in black. Various reporters have relayed strange events, including one case where a tape recorder was grabbed from a reporter and thrown down the stairs by an invisible force. In another case, a reporter witnessed a ceiling light begin spinning on its own. Zoar was a village built by German separatists who were looking to establish a place to live and practice their Christian religion as they saw fit. Established on October 16, 1817, Zoar was named after the biblical town where Lot fled to after leaving Sodom. The community was established as "The Society of Separatists of Zoar" in 1819. There are a number of haunted houses in Zoar that constantly produce haunting accounts from visitors. A local group of paranormal investigators report experiencing objects thrown at them multiple times, and a closed piano playing on its own, at Number One House. Clues to some of the hauntings in Zoar are portrayed in The Ghosts of Zoar, Ohio by Ann Sawin and Betty O'Neill-Roderick. This book details many of the tragedies that took place in this town, including that of Lorenz Fritz. Near Christmas of 1888, Lorenz took the train to Massillon to buy Christmas candy for his three children. He never returned home from the trip. His wife assumed he had decided to remain in town to drink with friends, since it wasn't the first time this had happened. However, she was awakened in the middle of the night by her son, Eugene, who insisted that daddy was standing in the corner of the bedroom, dripping wet, but would not speak to him. By the spring of 1889, once the snows melted, authorities discovered Lorenz's body in the river by the train tracks. Built in 1912, this mansion was a 52-room behemoth built for a cast-iron stove magnate. In later years, the house became a halfway house, a boarding house, and a home for unwed mothers. Staff and residents reported encountering the ghost of a lady in old fashioned dress with her hair in a knot on the top of her head. 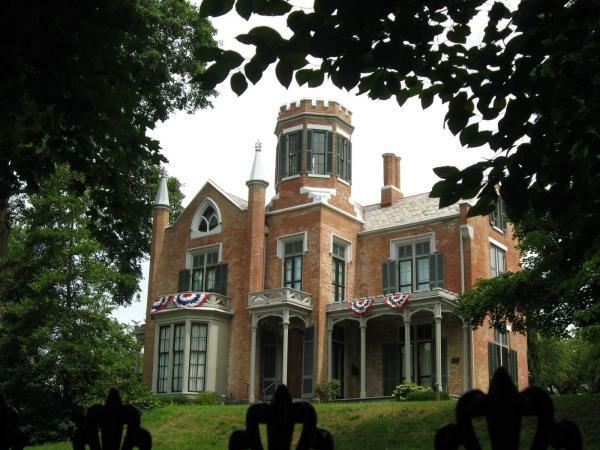 Built in 1855, the Castle Historic House is a gothic revival home that housed only five families through the mid-1970s. Today, it is a historical museum. Viistors, volunteers, and staff report seeing apparitions, hearing disembodied voices, and more. Take a historic castle tour or, if you're there at the right time of year, take a ghost tour. The castle is located at 418 Fourth Street in Marietta. The Buckeye State is famous for its well-known historical legends. However, in addition to its well-known history, there is another, darker history that explains why so many locations and structures are reported as haunted throughout Ohio. Ohio haunted houses reflect this dark and mysterious history and provide glimpses of the lives of people who used to live at these locations during the earliest recorded years of the state of Ohio.